If you think that Minecraft characters could be more realistic, instead of having steady and rigid animations, this mod is just for you! It makes creatures seem alive, and adds variety of other epic features! This mod is client-side. That means, you only need to install it on the client for it to work, no need to install it on the server. I'm having some trouble with the 1.7.10 version of the mod. 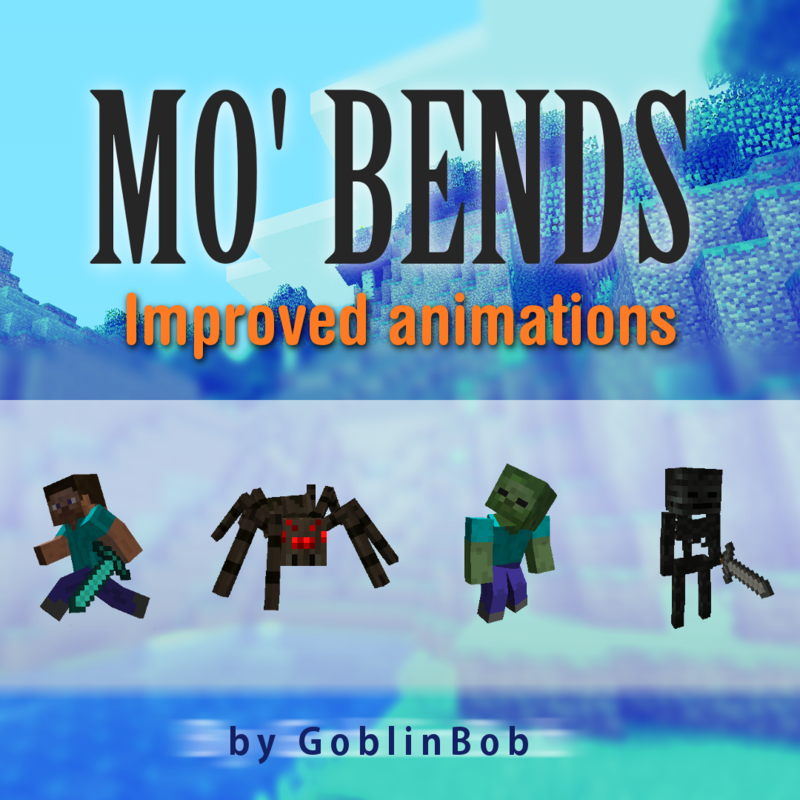 The Mo' Bends menu shows up in the game but the animations themselves don't work at all. I made sure I'm on the default animation setting and everything. I'm really not sure where to go from here. Hi! This mod is very cool and i play a lot whit this,but i have a problem. Mining whit the pickaxe is a bit annoying because it's too close to my face or something like that.Im using another mod called 'Realistic first person render' mod and if you combine them you basically see mo' bends mod in first person too. Please make somehow the mining animation better like not right in front of the caracter's face.I know that i can create my own pack inside the game and i could fix it myself but i don't know how ! Please help me because i love this mod and i play a lot whit it but this is the only thing that i don't like. I'm not saying this will work, but try going into the RFPR config in your config folder in .minecraft and switch the offset from 0.35 to whatever you think would work for you. I'd suggest anything between 0.05 and 0.25. Going above 0.35 causes the camera to move further ahead of the body. The animations are fantastic, but the mod replaces the sweet sweet modular power armor with something else really low res when I'm using it. Is it intended? Do you think you could add support for iChun’s Hats mod? I’d love that! 💙 Currently, hats from Hats act as though Mo’ Bends isn’t installed and thus don’t move with the player’s head. I use this mod as an essential part of my gameplay, I am wondering when the new update will be out. I really can't say for sure when the update will be out as there are still many things to implement :). I use this mod along to real first person render. It works perfectly most of the time, but it annoys a bit when you're mining or building and the animation keeps playing right in front of your face. First, I don't think this animation makes sense, because it's basically hitting to the side, not what is in front of you. I just wanted to turn off the animation for breaking with a pickaxe and placing blocks, because the default animation isn't a problem, but I don't really understand how the custom animations thing work, is there a way to just pick the default pack and turn off specific animations? Or is there a guide to properly create a custom pack on top of the default? Turning off certain animations is on my to-do list :). I'll work that feature in eventually ;). Sorry for the inconvenience in the mean-time. This mod is phenomenal. I have one question, though: Does it affect performance (frame rate, etc.) in any way? Yes, the currently released version of the mod does impact performance a bit, but we're trying our best to optimise the hell out of it for the upcoming 1.0.0 version :). All right. Thanks for the reply. We've reworking the system with compatibility in mind and so far, a lot of MPM features are working as intended :D. You'll have to wait for the 1.0.0 version, or any pre-releases to be published.